The architect Wallace Neff built more than 500 homes for celebrities and dignitaries during the Golden Era of Hollywood from 1920 through 1972. Drawing from the imagery of the Spanish, Italian, French and English, he created luxurious homes for the stars. Robert Hansen has worked with Wallace Neff Jr. for over 30 years photographing the homes of Jack Lemmon, Dr. Jules Stein, Fred Niblo, The Gillette Home and many more classic Neff designs in Pasadena, Santa Barbara, Beverly Hills as well as The Doheny Library. This edition, size 11"x13", is traditionally printed on high-quality luster paper and hardcover bound. 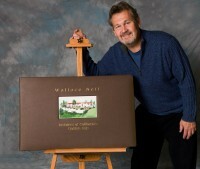 Each book is signed by Wallace Neff Jr. 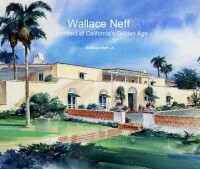 This edition made its debut with a reception in February 2010 at the Huntington Library, home of the Wallace Neff Archive. Sized 17"x30", it is limited to 50 copies. Luxuriously bound in genuine leather, each of its 117 pages is personally printed by Robert Hansen on heavyweight archival watercolor paper. Each book is signed by Wallace Neff Jr.